Mortice 10-lever deadlock (5 levels on each side of the locking bars’ lath). The model corresponds to the forth (the highest) class of the Russian governmental standard. ZV8 250.0.1-18 is a modification with no front plank. Can be sold with the front plank ZV8 25.102 in the kit. 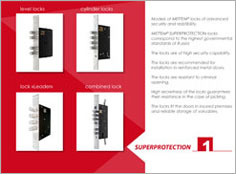 The model locks a door with five steel locking bars 18 mm in diameter which move forward 40 mm. One of the locking bars contains a core made of hardened steel which prevents from sawing.